Company: 1) Tricorp Construction, Inc. 2) Tony Moayed Construction Services, Inc.
Assad Tony Moayed is a highly regarded construction professional who has more than 36 years of experience in the industry. He currently serves as the CEO of Tricorp Construction and founded Tony Moayed Construction Services, Inc. in 2003. An expert in construction management, he is responsible for negotiating contracts, leading large and small projects across the state of California, and overseeing the companies’ operations. Throughout his career, Mr. Moayed has remodeled eight to 10 homes in the last 30 years, bringing them back to their original condition. He has also worked with some of the largest general contracting companies in the United States. For his exceptional worked, he won the General Contractor of the Year award by Tricorp Construction in 2006 and 2007. 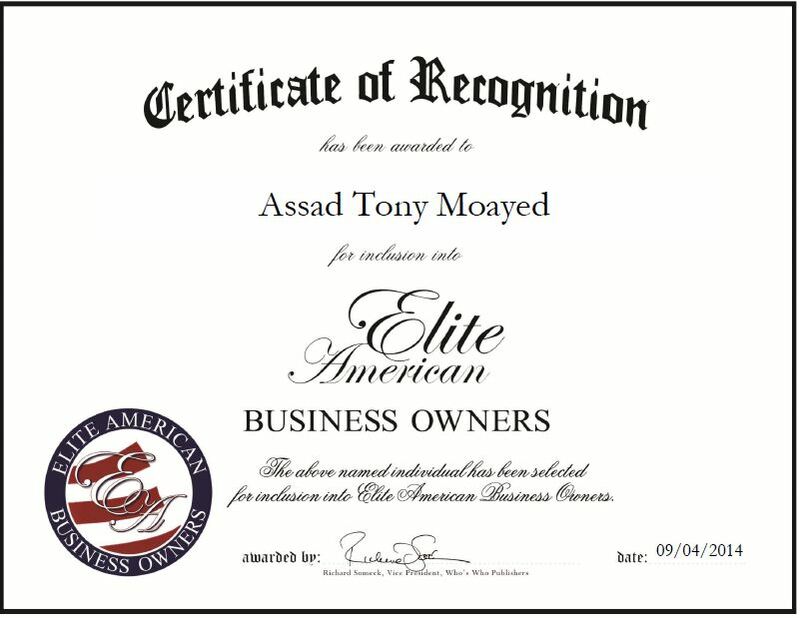 Mr. Moayed takes great pride in his work and attributes his success to his hard work. He is a licensed general contractor in the State of California and holds a certification in energy and environmental design. To keep abreast of changes in his field, Mr. Moayed is affiliated with the American Society of Heating, Refrigerating and Air-Conditioning Engineers, Construction Management Association of America, and American Construction Inspectors Association. This entry was posted in Construction and tagged construction management, energy and environmental design, general contracting, remodeling. Bookmark the permalink.